The long-awaited Monthly Girls’ Nozaki-kun premium box set is hitting the shelves on March 29, 2016, made possible by fan support from YOU GUYS! While you’re anxiously waiting, get ready for the big premier by taking our quiz! Are you an overzealous Seo? Or are you more of a sweet Chiyo waiting for senpai to notice you? Are you a clueless Nozaki, or maybe more of an embarrassed Mikorin? With a unique cast like this, you’re bound to find SOMEONE you’ll identify with! 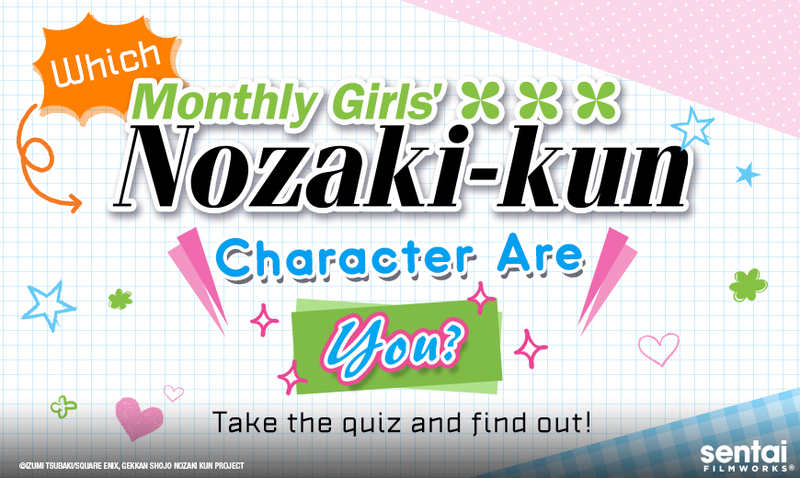 Find out which Monthly Girls’ Nozaki-kun character you are, and share your results on Facebook and Twitter! What’s Inside the Monthly Girls’ Nozaki-kun Premium Box Set? If you’re wondering what all the fuss is about, don’t forget to check out our premium box set reveal video, or get the details on each item from our Monthly Girls’ Nozaki-kun box contents reveal blog post!